Gold's decline has taken a toll on miners, and Yamana Gold, Kinross Gold, and IAMGold have been particularly hard hit. But they could be due for a rebound. For gold investors, the last few years have been tough. After peaking in 2011 near $1900 an ounce, the price of gold has plunged more than 30%. 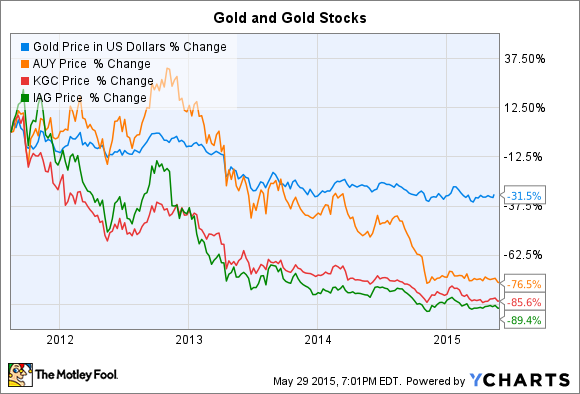 But the decline in gold prices looks downright tame when compared to gold stocks. Pure play gold miners, in particular, have been devastated -- some stocks have fallen upwards of 80%, and a few have been forced into bankruptcy. The drops in Yamana Gold (NYSE:AUY), Kinross Gold (NYSE:KGC), and IAMGold (NYSE:IAG) have been particularly severe, perhaps unduly so. As miners, all three firms will have a difficult time if the price of gold continues to decline, but a resurgent gold market could propel these stocks to their former highs. To be clear, all the stocks on this list have issues -- if they didn't, they wouldn't be so oversold. Yamana Gold is no exception, but there are many things to like about the company. Last quarter, Yamana Gold produced 304,874 ounces of gold -- an increase of 33% from the same quarter last year. Meanwhile, Yamana's costs have been coming down. Its all-in sustaining costs, a measure used to estimate the costs associated with mining, were just $893 per ounce last quarter at the mines it continues to operate. That's down 15% from the same period last year, and the company expects further declines: for all of 2015, Yamana's management estimates all-in sustaining costs of around $800 to $830 per ounce. Given the significant gap between Yamana's costs and the spot price of gold (around $1200 at the time of writing), the company is generating cash flow from operating activities -- $96 million in the first quarter. Yamana conducted an offering of 56.5 million common shares in the first quarter, which weighed on its share price but improved the balance sheet. It also plans to spin off its lower quality Brazilian mines as a separate company (called Brio Gold) later this year. It's unknown how much cash Yamana will receive from Brio, but it could be used to reduce its debt and protect its dividend. At current levels, Yamana yields around 1.60%. Kinross Gold has higher costs than Yamana, but they are likewise trending down. In the first quarter, Kinross' all-in sustaining costs for one ounce of gold stood at $964, down from $1001 in the same quarter last year. Despite the gap between its costs and the price of gold, Kinross was unprofitable during the quarter, but that was largely a byproduct of currency fluctuations. Moreover, Kinross' quarterly report exceeded analyst expectations on both the top and bottom line. On an adjusted basis, Kinross was profitable, and it generated nearly $215 million in operating cash flow. These results came in spite of operations problems at its mine in Chile. Heavy rain knocked out power to its Maricunga operations, but they're expected to resume some time this month. Kinross has about $2 billion worth of long-term debt, but more than $1 billion of cash on its balance sheet, more than one-third of its market cap. Further declines in the price of gold are likely to weigh on Kinross, but shares could come roaring back if gold heads higher. Both Yamana and Kinross are fairly cheap stocks, currently trading at around half their respective book values. IAMGold, however, is even cheaper still -- it's currently trading below one-third of its book value, making it one of the cheapest stocks in its industry. IAMGold has under-performed analyst expectations in recent quarters, which may be why investors are more skeptical. It also has higher costs than its peers: IAMGold's all-in sustaining cost for an ounce of gold was $1113 last quarter. But those costs are coming down -- the all-in sustaining cost was $1198 per ounce in the first quarter of 2014. IAMGold's total production also rose, to 208,000 ounces last quarter, up more than 20% from the same period last year. IAMGold wasn't profitable -- its operating costs rose, and it lost money on some of its derivative contracts -- but it did generate $30 million in cash from its operating activities. IAMGold has a healthy balance sheet, with over $800 million in cash and just over $600 million in long-term debt, so it should be able to continue to ride out the current gold bear market for many quarters to come. And if gold prices begin to rise, the stock could surge higher.